The Nishat, like other gardens of its size, was originally planted with avenues of cypress and fruit trees. On two of the terraces green depressions mark the sites of former parterres. The garden will be even more lovely when these old details are taken into account ; when roses are once more trained down the sides of the walls, and soften the edges of the steps by the water, repeating the motive of the cascades they enclose. Taking a hint from the early Mughal miniatures, where the garden is " flower -scattered " like some picture by Sandro Botticelli or from the alpine meadows on the crags, which rise 4000 feet above the Nishat Bagh, let us scatter spring flowers under the fruit trees. White iris still light up distant corners of the garden with their frail beauty. But purple and mauve iris should be massed near the lilac bushes ; narcissus and daffodils planted under apple and quince trees; and the soft turf under the snowy pear and plum trees should blaze again with crown-imperials and the scarlet Kashmir tulips. The Mughal flowers were spring flowers ; but roses, carnations, jasmine, hollyhocks, delphiniums, peonies, and pinks brought in summer. The baradari on the third terrace of the Nishat Bagh is a two-storied Kashmir structure standing on the stone foundations of an earlier building. The lower floor is fifty-nine feet long and forty-eight feet wide, enclosed on two sides by wooden - latticed windows. In the middle there is a reservoir about fourteen feet square and three feet deep, with five fountains, the one in the centre being the only old stone fountain left in the garden.On a summer day there are few more attractive rooms than the fountain hall of this Kashmir garden house. The gay colours of the carved woodwork shine through the spray in delightful contrast to the dull green running water. Through a latticed arch a glimpse is caught of the brilliant garden terraces and their waterfalls flashing white against the mountain side. Looking out over the lake which glitters below in the sunshine, the views of the valley are bounded by faint snow-capped peaks, the far country of the Pir Panjal. Climbing roses twine about the painted wooden pillars, and nod their creamy flowers through the openings of the lattice. All the long afternoon a little breeze ruffles the surface of the lake and blows in the scent of the flowers, mingling it with the drifting fountain spray ; for the terrace below the pavilion is planted after the old custom with a thicket of Persian lilac. 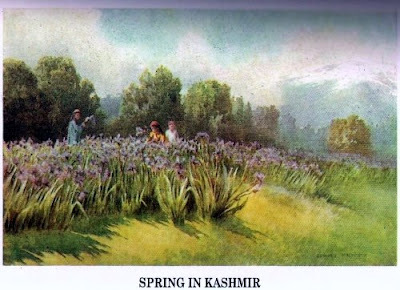 There are three flower festivals still observed every year in Kashmir, and the first of these is the lilac viewing. The lake-side by the gardens is crowded with boats when the long trusses of feathery mauve flowers are fully out. All day the people stream up the steps into the garden ; and, sitting in rows on the terrace wall above, drink in with delight the sweet colour and scent of these favourite flowers. Nearly all the older gardens show the remains of lilac thickets ; they were closely planted in squares divided by narrow paths through which to walk and enjoy their perfume. The narcissus fields and tulip fields vanished next follows the festival of the roses. The Shalimar Bagh is most frequented on this occasion. Crowds come from the city, bringing their women-folk, their babies, and their birds. Gay family parties gather on the grass chabutras, listening to the plash of the water and the sweet little piping of the birds, or smoking their hookahs and talking endlessly in the shade. Beautiful groups they make : the women with their rose and orange robes and graceful long white veils, and the enchanting Kashmir babies, their fair faces, dark eyes, and curls peeping out from under little bright green caps, from which their large round tinsel earrings dangle. One can hardly tell whether the babies or the flowers they are brought to look at are the prettier. Pink roses grow beside the water, red flowers fill the parterre which with its paved stone walks surrounds the zenana baradari. .But the loveliest roses in the garden are the Marechal Niels, which climb the grey-green walls of the Hall of Public Audience and hang their soft yellow globes head downward in clusters from the carved cedar cornice. 1.Wildly growing flowers in meadows of Gulmarg. Shot in the month of June, year 2008.